Already an NHL veteran of 7 seasons with the Montreal Canadiens and the Chicago Black Hawks, left-winger Ab McDonald arrived in Providence during the1964-65 season for a brief 6-game stint with the Reds. He would move on to play the balance of the season with the Boston Bruins and 10 more seasons in the NHL. Known as a creative offensive player, he was also a crafty back checker and penalty killer. He played nearly 800 games for six different clubs in a career that lasted from the late 1950s to the early '70s. He was inducted into the Manitoba Sports Hall of Fame in 1996. The Winnipeg native excelled in the MJHL with the St. Boniface Canadians, before joining the OHA's St. Catharines Teepees. 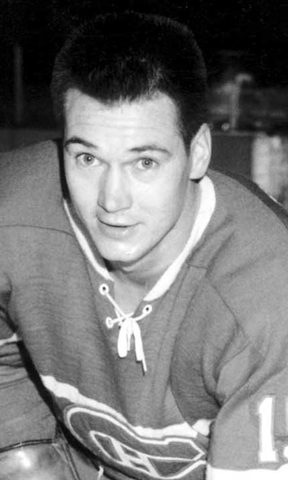 After scoring a combined 82 goals during his two years with St. Kitts, McDonald enjoyed two solid years in the AHL with the Rochester Americans. The young forward dressed for two playoff games with the Montreal Canadiens when they won their third consecutive Stanley Cup in 1958. The next year, he scored 13 goals as a rookie working on a line with Ralph Backstrom and Don Marshall and was a part of two more Stanley Cup triumphs. Still, he was not popular with the Forum patrons who expected him to be as good as the man he replaced, Bert Olmstead. In June 1960, McDonald was acquired by the Chicago Black Hawks and helped the team win its first Stanley Cup in 23 years. He also worked on the original "Scooter" Line with Ken Wharram and Stan Mikita and notched two 20-goal seasons. After his one season with the Bruins, he moved on to help the Detroit Red Wings reach the Stanley Cup finals the next year. In June 1967, the Pittsburgh Penguins claimed McDonald in the expansion draft. He scored 22 goals while teamed with Andy Bathgate and Val Fonteyne then was traded in the off-season to the St. Louis Blues for Lou Angotti. McDonald spent two years in Missouri, helped the club reach the Stanley Cup finals twice and recorded a personal best 25 goals in 1969-70. He also participated in the 1969 and 1970 NHL All-Star Games. After two years in the WHA with the Winnipeg Jets, he retired after the 1973-74 season.